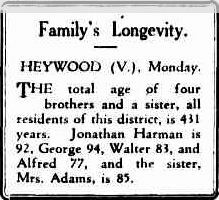 In September 1929, the Advocate from Burnie, Tasmania, reported on the Harman family and their longevity. Jonathan died the next year, George made it to 96, Walter 90, Alfred 81 and Sarah (Mrs Adams), 86. 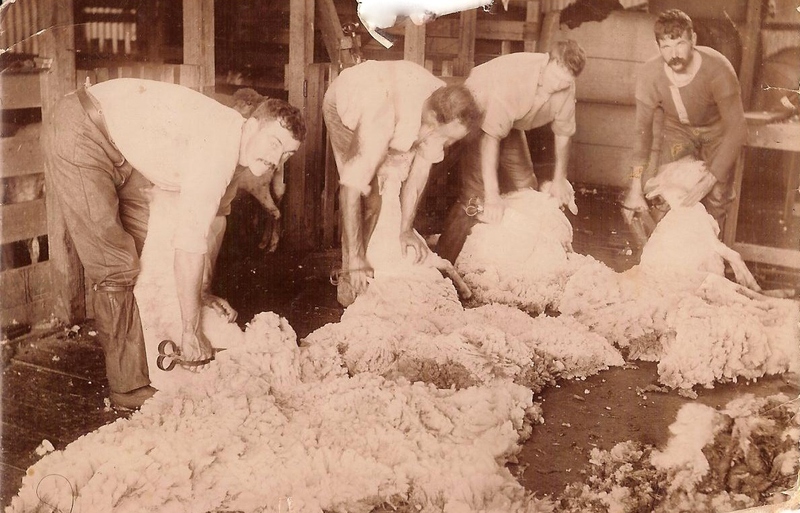 Add brother James who died in 1916 at the age of 86 and the average age of six of the seven children of Joseph and Sarah Harman that came to Australia was 88. Reuben Harman did not achieve the longevity of his siblings. He died in 1883 aged 44 but if he had of lived on, he would have been the third pea in a pod, with brothers James and Jonathan. Reuben was born in Melbourn, Cambridgeshire in 1839 and by the age of 12, he was already working as an agriculture labourer as the 1851 UK Census shows. He was the youngest of the trio of brothers who sailed to Sydney aboard the “Kate” in 1854, aged 15. Absalom: Birth: 1868 at Byaduk’; Marriage: 1904 to Hazel Maud FILMER; Death 1954 at Bannockburn, Victoria. Gershom: Birth: 1869 at Byaduk; Marriage: 1905 to Elizabeth HILLIARD; Death: 1940 at Hamilton. Jessie: Birth: 1871 at Byaduk; Marriage: 1898 to Walter GREED; Death: 1949 at Hamilton. Beatrice: Birth: 1878 at Byaduk; Death: 1929 at Hamilton. Sarah Mulbery: Birth: 1880 at Byaduk; Death: 1931 at Hamilton. I have found two references to Reuben at Trove, both from the 12 months before his death. The first article about Reuben was for a transfer of a lease from himself to brother Jonathan, found in the Portland Guardian of May 23, 1882. 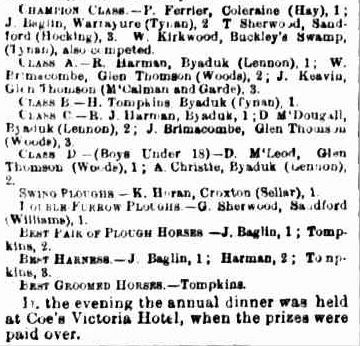 The second, in The Argus of August 19, 1882, reports on the Hamilton ploughing match at Strathkellar, east of Hamilton. Reuben won Class A, a division down from Champion Class, in heavy conditions. His plough of choice was the Lennon, also favoured by brother James. He rounded out the day with a second place in the Best Harness class. On April 28, 1883, Reuben Harman passed away aged just 44 from hydatids. Reuben was buried at the Byaduk Cemetery. James Harman was the executor of Reuben’s Will and was very exacting in his application for probate. Reuben’s estate was to the value of £1226, quite a tidy some in 1883. His assets included 128 acres of land, divided into two parts, one with a two roomed slab hut with an iron roof and slab partitions. There was also a further 26 acres of land, 3 horses, 17 head of cattle, 150 sheep, a buggy and a almost new plough. There is a record of an interest he had in selected land of 70 acres. After Reuben’s death, Elizabeth was left to care for the children, then aged 17 down to three. The first to marry was Bertha in 1892, when she was 26. Gershom and Jessie also married, however the two youngest daughters, remained unmarried. Elizabeth, Beatrice and Sarah eventually moved into Hamilton, with the two girls working as knitting manufacturers. In 1907, Elizabeth returned to Byaduk to represent her family in a photo at the Byaduk and District Pioneers day. She appears in the group photo from the day. Elizabeth died in 1919 at Hamilton. 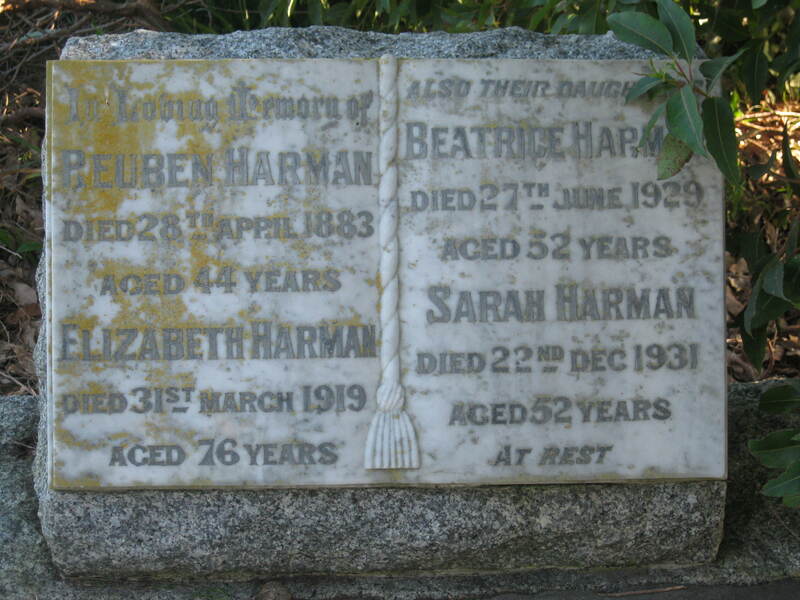 Beatrice and Sarah only lived for another 10 and 12 years respectively, both dying at 52. This is the last story of the four Harman boys who travelled independently to Australia. The last three Harman siblings, Sarah, Walter and Alfred, travelled with their parents, Joseph and Sarah to Australia. Sarah was 11, Walter 10 and Alfred only three. The stories of those three Harmans are very different from their four older brothers. This entry was posted in Harman and tagged Byaduk, Filmer, Fullbrook, Greed, Harman, Hilliard, Oliver. Bookmark the permalink.